Power OFF the Media Hub. Push the button on the top panel & remove the drive bay cover. 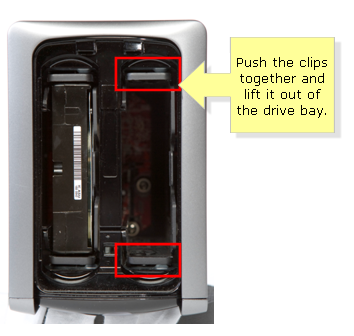 Remove the drive bay carrier with the hard disk by pushing together its clips and lifting it out of the drive bay. Remove the hard disk from the drive bay carrier and only send the hard disk for RMA.